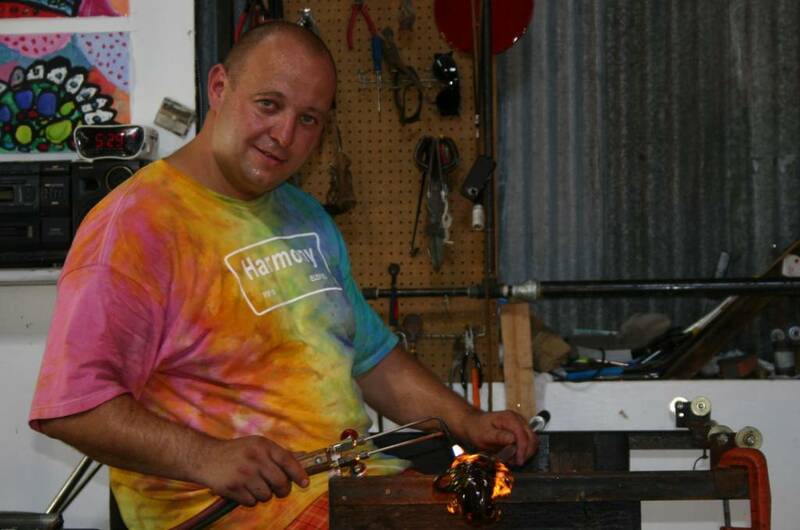 Jiří Pačinek is coming to Harmony Glassworks in April! Jiří Pačinek born in Litomerice (Czech Republic) on July 3rd in 1972. He studied at Glass apprentice centre in Novy Bor from 1987 till 1990 in the section of glass blowing and hand shaping. He started his career of glass blower in Czech famous Chribská glass works focusing mainly on free-hand shaped glass. In 1991 he was called to army and after return back he started to work in Chribská glass works again. June 3rd in 1992 was exceptional and fundamental day in glass career and contemporary art creation of Jirí Pacinek for he was admited to work as glass-blower in AJETO (at that time named as NOVOBOR) in Petr Novotny’s team. In September 1995 he left to USA for 3 months working residency by Leon Applebaum glass studio in Rochester. After return back to AJETO he was appointed as master of glass team. He is regularly attending significant world glass events – symposiums, conferences and other proffesion and art meetings in Europe and overseas, for example International Glass Symposium in Novy Bor, Glasstage in Zwiesel, Glass Art Society in USA and many other events in different countries. He has also won several prizes, for example in glass competition “Craft and Art” organised by Glass museum in Novy Bor it was second prize in 1994, first prize in 1997 and third prize in 2006. Jirí Pacinek’s glass sculptures combine exceptional body force and sculptural way of glass making with delicacy and sense of detail and its accuracy. Jirí Pacinek found AJETO and Petr Novotny as unique spring of inspiration and knowledge and he made the best of this special oportunity to work in AJETO and created own easily recognizable style of creation. Besides family he has been putting all free time to glass and AJETO glass works. He spent many days working in Petr Novotny’s home glass workshop, where he got familiar with production of ancient glass replicas as well as in AJETO, where he could create astounding glass sculptures. In the end Lindava became his home and few years ago he opened own glass art gallery right in his living house. Up to now Jirí Pacinek has created glass for many world known glass artists and designers,among others: Miluse Roubícková and René Roubícek, Borek Sípek, Leon Applebaum, Rony Plesl, Sem Schanzer, Louis Sakalovski, Charles Parriott, Anna Torfs and many others. This makes his artworks such typical, recognizable and unique. In own creation he focuses to various glass lines – demanding sculptures mainly human or animal figure inspired as well as domestic glass units like vases, bowls, glasses, plates and other items. Many of them became a part of several museum and private collections or they are being produced in limited or numbered editions.